A.S.P. 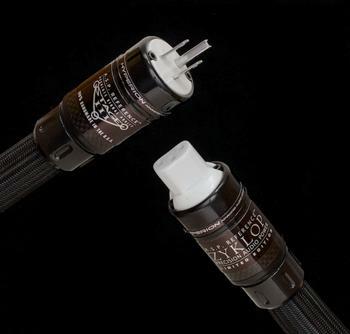 REFERENCE ZYKLOP power cables will enhance almost every performance aspect of your system. Treble and midrange are smoother and better defined, while bass increases in depth and articulation. Increased video contrast and sharpness will make images practically holographic. All this while removing artifacts and noise that subtly mask the fine delicacies in music and images. The IEC and mains plug use silver/copper alloy electrical contacts that in conjunction with the massive conductor array, allow this unique cable to have extremely low resistance, making it especially well suited for power amplifiers, where current demands can fluctuate drastically and very quickly. This design represents the unsurpassable limit for linear, silent and unrestricted power delivery for the best audio and video components. A.S.P. REFERENCE ZYKLOP power cables employ 8 palladium/silver alloy AeroStrand Ultra™ conductors (2.5mm x 0.55mm) for each polarity in a tubular helix geometry. Air dielectric with FEP Teflon air-tubes. 100% radiation invulnerable shielding uses exclusive H.D.A. (High Density Alloy) foil plus nickel plated copper braid, with individually protected ground, positive and negative conductors. Multi-layer construction with silica/ceramic/ferrite mechanical damping/shielding layer.